Do you like Barbie and Halloween? If yes, the game is your cup of tea! You have to dress up Barbie for the Halloween party. You can choose one of the horrific dresses and make Barbie a star of the party or she can be a beautiful girl among Halloween monsters. 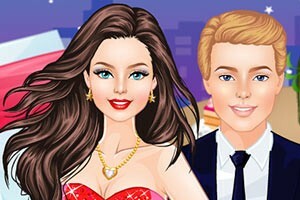 Great choice of clothes, hairstyles, hats, shoes and Barbie’s chilling makeupwill let you play for a long time. To play the «Barbie Dark Princess Scary Halloween Stories» you will need only mouse and your imagination. Make Barbie a pretty or hair-raising horror girl, prepare her for the best Halloween party! Do you like Barbie? Definitely yes, especially when she is going to disco competition! It will be great show! But it’s a difficult to win. Firstly, you have to win the hearts of referees. That’s why it’s necessary to dress up her. Let’s choose really beautiful dress. Every detail must be at its place. You will have a great choice of dresses, shirts, pants and shoes. Also there are a lot of accessories. Moreover, you may choose the hairstyle. So, Barbie will look as you want! Victory depends on your choice. Dress affect the result. 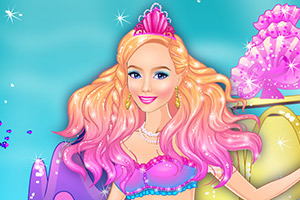 Make Barbie a princess and get the first prize! Ooh, l’amour! Cutie Barbie is really in love with her attractive blue-eyed boyfriend and planning an amazing romantic date for the Valentine’s Day. Probably they’ll go to a luxurious restaurant or even fly to Paris! But the usual question is what to wear to knock this charming guy down? That’s the reason why Barbie is now standing in front this huge wardrobe feeling lost and confused. Don’t leave her alone with such an enormous problem and work as her experienced fashion advisor. Choose the best romantic dresses, hair-cuts and accessories for this cutie! Try and do your best because this pretty lady deserves the best date ever! And of course her blue-eyed Prince Charming will be thankful to you too! New York is the neon city that never sleeps especially throughout the Fashion Week that is considered as an outstanding event in the glamorous and stunning world of modern fashion. This young girl came to the Big Apple planning to start a triumphant modeling career and that’s why she badly wants to appear in a numerous Fashion Week shows. Work as a qualified fashion assistant for our beautiful heroine and choose the best designer dresses, accessories, haircuts and high heels for this young lady so she will look just dazzling on the New York catwalk. Show all your creativity and help this pretty lady to fulfill her burning desire of becoming the supreme star of the fashion industry. Though miracles can happen any time of year, there’s no doubt Christmas is still the best time for magic! Princess Barbie is looking forward to cheerful winter holidays and wants to look gorgeous for her dear friends, relatives and even for Santa Claus – why not? So help Barbie and give her a mind-blowing gift – the most stylish winter dresses, glamour shoes, shining diadems and magnificent jewelry. With your help Barbie will surely become not only a cute princess, but a real queen of all roaring winter parties, masquerades and promenades. Snow White Dress in a variety of beautiful dresses! 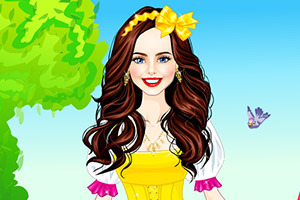 Put on the clothes of your favorite cartoon Snow White, including her classic dress! Put any type of clothing that you want! Lady Charlotte daughter of the Duke and Duchess of Britain. Help her decide attire. For her, it is very important to look at today’s reception for one hundred percent. Do not fail.